Who Will Be Sonoma County’s 10th Poet Laureate? Nominations are open for Sonoma County’s 10th Poet Laureate. 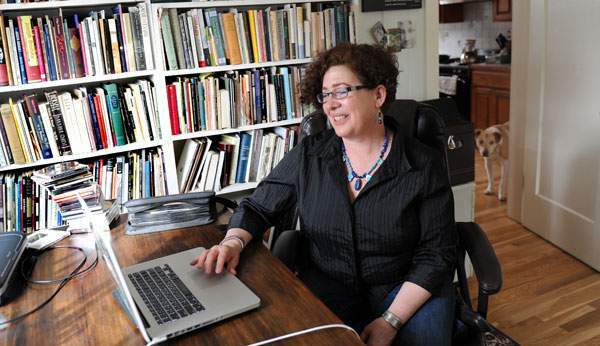 The Poet Laureate is a Sonoma County resident whose poetry manifests a high degree of excellence, who has produced a critically acclaimed body of work, and who has demonstrated a commitment to the literary arts in the County. The Poet Laureate often participates in official ceremonies and readings and will serve for two years (2018-2019). The Poet Laureate Selection Committee is pleased to announce that starting this year, the Poet Laureate will be awarded a $1,000 stipend in addition to his or her title. Deadline for nominations is November 7, 2017 and the new Poet Laureate will be announced in December. Consistent with tradition, the Sonoma County Poet Laureate will not have a formal job description but will be encouraged to develop an agenda promoting poetry and the literary arts in Sonoma County. Organizers of various community events in Sonoma County may invite the poet laureate to participate in their events. Nomination forms are available on the Sebastopol Center for the Arts website: http://sebarts.org/images/uploads/2018-19_Poet_Laureate_Nomination_Form.pdf. Send the completed forms to cynthi@sebastopolfilm.org or call the Sebastopol Center for the Arts at 707-829-4797. Opening Ceremony Sunday, October 1, 2017 – 11 a.m. to 3 p.m.
Join in this lively celebration of remembrance highlighting the arts and culture of Latin America. El Día de los Muertos is a ritual celebration from México, Latin and South America in which the spirits of dead loved ones are invited to visit the living as guests. Observed in Mexico on Nov 1st and 2nd, this tradition reflects the belief that death is part of life, and so, instead of sadness this is a time of remembering and rejoicing. As celebrated in Petaluma for the past 9 years, the observance presents an opportunity for cross-cultural sharing and a unique partnership between the Latino and Anglo communities.The events kick off today with the opening ceremony at St. Vincent de Paul Church Plaza, and continue throughout the month, ending with a candlelight parade on November 3rd. 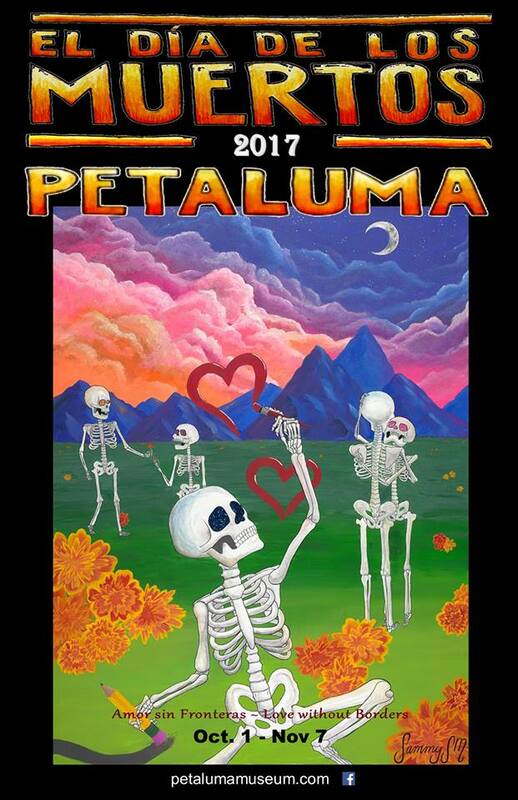 For details about the events, photos, videos, and more, visit the Facebook page: www.facebook.com/El-D%c3%ada-de-los-Muertos-Petaluma-154451587898565. Here are a few of the latest publications. 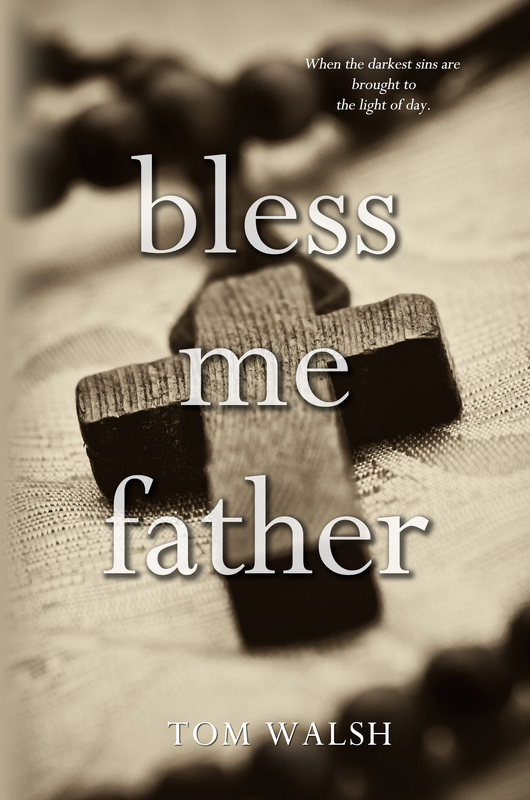 Bless Me Father is a new mystery thriller by Sonoma County author Tom Walsh. The novel is published by Melange Books and more info is available at www.bless-me-father.com. 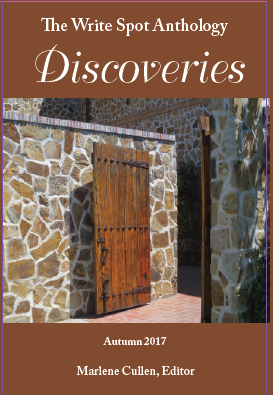 Marlene Cullen invites the literary community to the anthology release of The Write Spot Anthology: Discoveries on Sunday, October 22, 2 pm, at Copperfield’s, 140 Kentucky St, Petaluma. Anthology participants will read excerpts from the anthology. The anthology features eleven writers who turned their freewrites into polished pieces. Each piece includes a prompt that inspired the writing. The anthology includes information about freewrites and how to use writing prompts. It’s a personal and portable writing workshop!Available now at Amazon.com. For more information, check out Marlene’s website: www.TheWriteSpot.us. This anthology from award winning local writers includes nearly 50 works of nonfiction, fiction and poetry. Each piece is set in a wondrous land of rugged coastline, river valleys, hillside vineyards, and redwood forests. 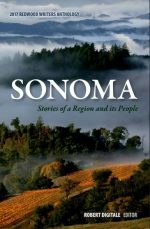 And each tells a distinctly Sonoma story. Purchase at Redwood Writers meetings or Amazon.com. Come celebrate writers, nature, and community at the annual Watershed Festival. This year’s event is on Saturday, October 7, noon-4:30 pm. It’s held at the Civic Center Part in Berkeley, at MLK Jr.Way and Center. The event is free. For more information about the poets, musicians, and exhibits at the Poetry Flash website: www.poetryflash.org. Three Days of Spoken Word! Friday, October 13, 3:00 p.m. to Sunday, October 15, 3:15 p.m.
Congratulations to Sonoma County poet and environmentalist Maya Khosla! 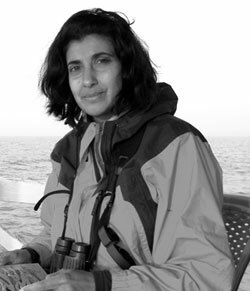 Sixteen Rivers Press is delighted to welcome new author-member Maya Khosla. Maya’s efforts to film and create awareness about the high value of post-fire forests can be viewed at: https://youtu.be/ohWIrCb2liE; and a rough-cut from her 2014 efforts can be viewed at: http://johnmuirproject.org/scientific-research/black-backed-woodpecker-nest-density-study-sierra-nevada/. Her field efforts have been supported by Patagonia and the Sacramento Audubon Society. She has written Web of Water: Life in Redwood Creek; Tapping the Fire, Turning the Steam: Securing the Future with Geothermal Energy; and Keel Bone (Dorothy Brunsman Poetry Prize from Bear Star Press) and has received writing awards from Flyway Journal, and Headlands Center for the Arts. Maya is joined by Camille Norton, winner of the 2004 National Poetry Series and teacher at University of the Pacific. Her manuscript—A Folio for the Dark—and Khosla’s—Song of the Forest After Fire—were chosen in Sixteen River’s 2016–17 open-submission call for full-length manuscripts from Northern California poets. Hungy for a Good Ghost Story? Sixteen Rivers Press invites you to our 2017 Fall Fundraiser. Join us at a private home in Sausalitofor an afternoon of wine, hors d’oeuvres, a silent auction, and a reading by acclaimed poet Jane Hirshfield. The benefit offers an opportunity to meet the members, enjoy an inspiring reading in an intimate setting, and support this non-profit poetry publishing collective, which gives writers in the greater San Francisco Bay Area a chance to learn the book publishing process from the inside out, and to include their voices to our regional poetry scene. The benefit is on Sunday, November 5, 2017 from 2 to 5 p.m. Location: 80 Cloud View Road, Sausalito. For tickets, go to: www.brownpapertickets.com/event/3077941. $40 (Brook), $75 (Stream), $100 (Tributary), $150 (River), or $250 (Watercourse) per person Seating is limited, so Sixteen Rivers recommends getting your tickets in advance, though they will also be selling them at the door, space allowing. Do you have a book-length poetry manuscript? Insomniac Press and Matrix Magazine are pleased to announce the 2018 Robert Kroetsch Award for Innovative Poetry is now an international prize and we are currently accepting submissions. This year’s judge is the critically acclaimed poet, Johanna Skibsrud. The winner receives a trade paperback contract with Insomniac Press, which will include the publication of their manuscript, advance on royalties, and representation and distribution. The prize is awarded annually to the best poetry manuscript by an emerging writer (a writer who has published two or fewer books). Each year, the winning manuscript will be selected by an established poet in cooperation with Insomniac Press and Matrix magazine. For submission guidelines, check this link: www.matrix-magazine.org/robert-kroetsch-award. Rivers of fire rush the gorge. drown city-states and island nations. for one small mobile home. then slid over its face. So the foil-colored glasses revealed. Gravel pull-out, a few other seekers. Birds plunged into a bristling field. disking, kicking up plumes of dust. blue opal with two star sparks. long to bend it, wear it like a ring.